Just downstream from the Pont au Double is the Petit Pont. There has been a bridge at this location since before the Romans invaded the north. It's been destroyed and rebuilt many times. The Gauls used it to escape from the Romans and they would set it ablaze behind them. In the Middle Ages, Paris was an island (the Ile de la Cite) with the Petit Pont on the Left Bank and the Grand Pont on the Right Bank. 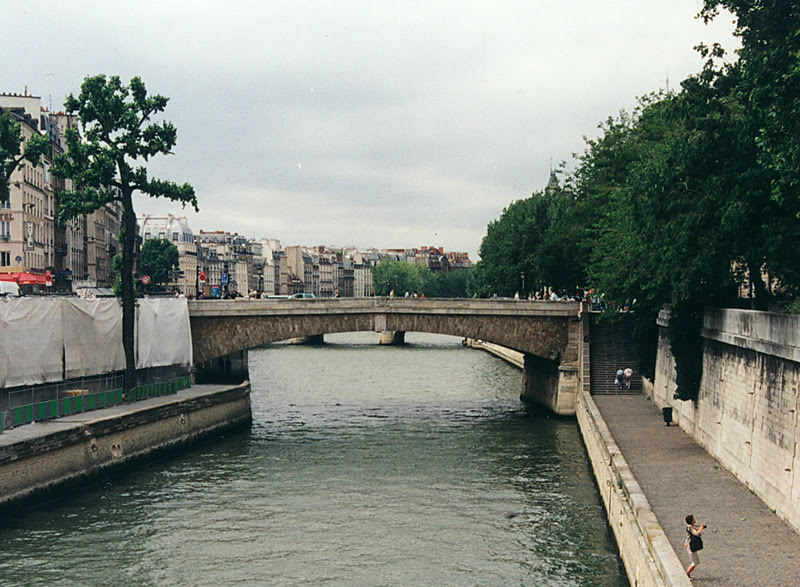 The Petit Pont was used by Abelard to visit Heloise, and probably by many other lovers. The current Petit Pont is a 32 m (100 ft) long single span stone masonry arch bridge. It is 20 m (66 ft) wide and carries vehicles and pedestrians. It has a distinctive keystone, a stairway to a riverside walking path, and one abutment is on the bank while the other is in the river. Seine River Bridges: Petit Pont by Mark Yashinsky is licensed under a Creative Commons Attribution-NonCommercial-ShareAlike 3.0 United States License.